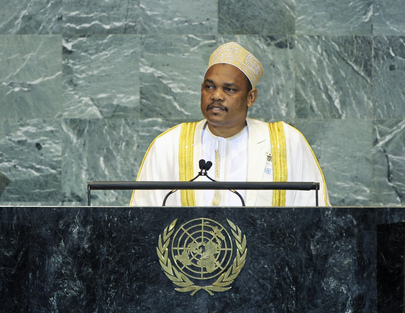 IKILILOU DHOININE, President of the Comoros, said humankind was facing one of the most difficult times; peace had never been so threatened in all regions and countries. It was threatened by political crisis, disease, natural disasters, bad living conditions and underdevelopment. The recent revolutions in North Africa and the Middle East continued to claim many victims as countries suffered from non-communicable diseases. All were threatened by natural disasters related to climate change, particular small island developing States like the Comoros. The international community must enhance its role of seeking speedy solutions to the crises, he continued. By acting together, countries could succeed in re-launching development, a key factor of peace and stability. Member States must further develop their solidarity to reverse the world’s growing vulnerability, he said, describing the “quasi-collective” effort by North America and Europe against the global financial crisis as commendable, but stressing that the effort must spread to other areas. Solid democracy and good governance in the Comoros would only be truly irreversible if poverty was erased, he said, pointing out that, as a small developing island country, it attached very special importance to the question of climate change and the environment. He said his Government worked hard every day to improve the lives of its citizens, but needed support from the international community. It maintained its modest contributions to the quest for a better world, taking part in the East Africa standing force and playing a role in the African Union-United Nations Hybrid Operation in Darfur (UNAMID). Terrorism, piracy and the trafficking of weapons were direct threats to security, and the Comoros was doing its best to combat them, but others must provide more assistance on prevention, he said. Conflicts unresolved for decades could also cause problems for peace and security, he said, noting that the current efforts of the transitional Government of Madagascar called for international support. That was also the case of Palestine, whose application for United Nations membership and statehood, within pre-June 1967 borders, the Comoros supported. The Comoros could not take a different position on that question since it was concerned about an equally significant matter affecting its own unity and territorial integrity. He went on to point out that the international community had not found solutions to the thorny question between the Comoros and France over the island of Mayotte. The visa regime imposed on Comorians by the French authority had broken up many families, and could not be continued without follow-up or settlement of the issue. The Comoros would continue to negotiate for Mayotte’s integration, but needed a realistic and lasting solution to the dispute, which had existed for more than 30 years. Similarly, he supported Morocco over Western Sahara and China’s One China policy for peace and prosperity. He added that a permanent Security Council post for Africa would help eliminate many frustrations and antagonisms.